For most folks, the summer months are too hot to justify using the fireplace, and for others these traditional built ins are not functional during any time of the year. Either way, a fireplace is designed to draw your eye and creates a central focal point in the room. Even when not in use, resist the temptation to ignore your fireplace in warmer months. 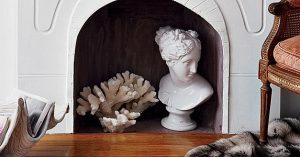 These nine suggestions will get you ready for a summer fireplace that stands out in a crowd. Plants add a pop of color and vibrancy to a space that can be dark and cool. 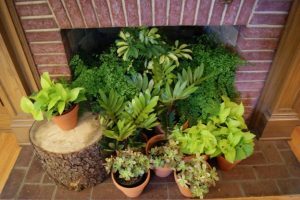 During the summer months, go big and green with vibrant indoor plants like ferns, ZZs, and ivy; or build a succulent garden with jade plants, cacti, and hens and chicks. Choose funky pots and layer them in the firebox where they will stay cool during the hot months while bringing a pop of bright summer color to your great room. The fireplace can showcase items of special importance. For large sculptures or statues, use the natural eye-catching design of the fireplace for displaying these large pieces. Opt for a simple design so as not to detract from the artwork itself and the space transforms into a stunning shadowbox. Use string lights to illuminate wood logs. 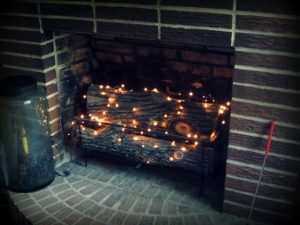 Stack real firewood in the firebox and use either tea light candles or thin strings of white lights to illuminate the space. For candles, use a drill to create “holders” in the wood for the tea lights and make certain that the logs are stacked in a completely stable fashion to minimize any risk of tipping while the candles are lit. Alternatively, wind wire-strand lights around the logs for a fairy-light look on a nearly invisible strand. Organize framed photographs of various sizes and heights in the fireplace to draw attention to the things that matter most to your family. Use mix-match frames and color photos of people and places for a funky, casual look, or use matching frames with black-and-white images for a classy, minimalist feel. If you have a small side table or console table not is use this could be the perfect place for it this summer! Setting an occasional table in front of the fireplace bring the space forward and provides a display space for lovely items or an additional resting spot for drinks and plates during a summertime gathering. Artistically stacked wood makes a lovely display and doubles as wood storage. 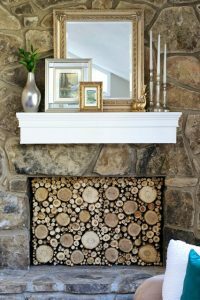 Consider stacking firewood in the fireplace over the summer in a decorative way, using up the entire space for a fitted wooden panel. The play of stone or brick with natural wood is both interesting and functional. For a funky feel, paint the ends of some or all of the wood logs in bright colors to accent other statement pieces in the room. Book shelves in the fireplace make for a compelling conversation piece. 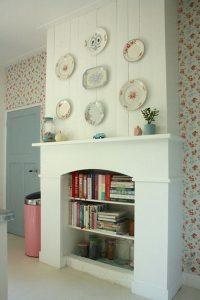 Simple shelves installed into the fireplace can be either temporary for a summer display or permanent for a non-functional fireplace. Fill the shelves with books for an unusual library or display books of special import for a bookshelf that is both functional and aesthetically compelling. If you’re not inclined to use the firebox for a display case this summer, or just didn’t get around to cleaning it out, you can always cover it up with a solid screen. Find something made with natural materials such as wicker or woven grass for a summertime feel. Mirrors expand the space and maximize light. Mirrors might be the single best way to help a small space feel larger. Like with the shelf suggestion above, you can either go permanent or temporary with this idea. A mirror the same size as the fireplace can be mounted against the back wall to visually expand the floor space and reflect the room back to the viewer. 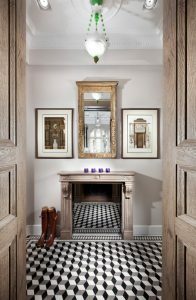 Alternatively, mirrors in frames can be layered in the firebox to reflect light at different angles and brighten the space. Click here to see all of our favorites ideas on Pinterest. This entry was posted in Dream Home, Family Home, House Improvement, Small House Plans and tagged dream home, fireplace, house plan, seasonal decorating on July 8, 2016 by Admin. Home design has always centered around the family unit. In this way, the legacy of domestic architecture can almost be read as a social history as much as it is an industrial one. Over the decades and centuries family structures have evolved as the world has changed. Some of the classic American house plan designs reflect this changing social reality. The Craftsman, for example, was a very popular home in the early industrial stages of American suburban life and the layout reflects the changing roles for mothers working inside the home. No longer were homes owned solely by the wealthy, and the lady of the house often did not have servants to manage the previously extensive housework. The kitchen and pantry areas were restructured to be navigated by a single person, and the big open windows overlooking yard spaces also denote the multitasking that was required of these new arrangements. House plan design almost always centers on the movements of a family through the house. As we see design evolve, it is almost always the result of changes in life movements. For the last many years the priority has been on flexible space as family structures change and roles of parents evolve. Home offices and in-law accommodations are on the rise as families adapt to new challenges and find creative solutions to their needs. This is one of the best parts of my job: designing homes that successfully meet the needs of today’s families, and to recognize the hard work that goes into making that house plan into a home. In honor of Mother’s Day, I’d like to say thank you to all the moms out there: whether you’re a mommy or a nana; whether your family is biology-based or blended; if you have more than two generations under one roof; if you work both inside and outside the home…. thank you for filling these many structures with love and support for all the growth we all continue to do. This entry was posted in Dream Home, Family Home, Floor Plans, Home Floor Plans, Home Floor Plans, Home Plans, House plans, Small House Plans, Uncategorized and tagged dream home, house plan designs, Mother's Day on May 10, 2016 by Admin. Back when architects were designing house plans by hand at large tilted drafting tables, a 3-D model was a luxury items usually relegated to large industrial or commercial projects. The benefit of those models, however, was paramount: having a replication of your dream project as it stands in actual space is a vital part of the process. With countless improvements in technology, those architectural models are now available without the balsa wood and gluing processes of previous years. And this accessibility makes for a better home in the long run: from designer to builder to purchaser, having a model to work from allows everyone involved to be on the same page. After nearly 40 years of designing homes, I am thrilled to be empowered to harness this technology. I have found that the improved clarity and transparency makes all the difference to families working on building their dream homes. This tool is of paramount importance when it comes to bridging the gap between designer and builder, and makes custom alterations a simple process. 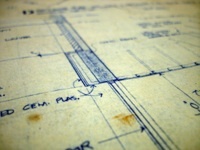 At MonsterHousePlans.com, we offer thousands of house plans. And once you’ve searched through them and narrowed down your favorites, this 3-D Intelligent Design option allows your dream floor plan to come to life. This is an invaluable tool when it comes time to begin work with your builder: the 3-D model allows us to include the architect’s specific designs and characteristics, while giving the builder real-space awareness of how all these pieces come together. And as terms of customizing your floor plan, this is the tool that allows you to see the impact of individual choices as it translated to the house as a whole. This industry has changed so much over the years. And while relics like the electric eraser have gone by the wayside, I am so thankful that modeling has followed us into these new methods of designing homes. There is nothing like taking an idea from your mind onto the page, and then again translating it into 3-D. It remains one of my most favorite examples of how the technological age has benefited the architectural industry: bringing real life examples of your dream home into the tangible process of everyone who buys a house plan. 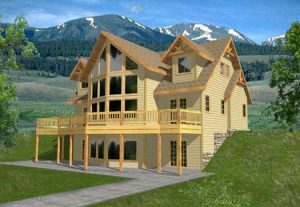 This entry was posted in 3D House Plans, Floor Plans, Home Floor Plans, Home Floor Plans, Home Plans, House plans, Small House Plans and tagged 3D Intelligent Design, house models, house plans on May 2, 2016 by Admin. Building a home is one of the most daunting tasks a family will ever go through. There are so many questions, so many unknowns and a tremendous amount of anxiety over what and how to build your dream. And always, the penultimate desire is to have the best possible home for the best possible cost. 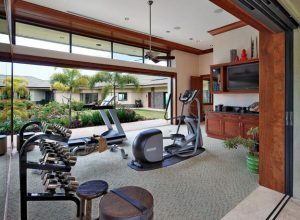 More and more, people are turning to the positive benefits afforded by the smaller home to address these concerns. Plans for smaller homes are becoming increasingly available and growing more popular all the time. The demand for small house plans is growing steadily and their popularity illustrates this shift in consumer preferences. It is becoming well-known that small house plans are the ideal place to start when embarking on the foray into building a home to suit your dreams. With so many unknowns and variables, more and more people are choosing to go with smaller domiciles. The smaller house has a lot of merit when compared with some of the truly massive miniature castles on the market today. With growing concerns over energy consumption, ecological footprints and green living, the smaller home is often an answer to these concerns in and of itself. The idea that “bigger is better” is falling by the wayside in a cultural movement that calls for more responsible stewardship of our limited, and thus precious resources. The smaller house, like the smaller car, is by its very nature not only more affordable to you, but also less costly for our already overtaxed, overburdened environment. These are the kind of careful considerations designers and architects are now putting into their small house plans with you, the consumer, in mind. Having considered how smaller homes offer an answer to many of the concerns and anxieties that arise when you first begin to contemplate building a home, let’s take a closer look into the benefits of small house plans. House plans are now widely offered through a variety of venues from hardware stores to online, searchable archives such as on offer through Monster House Plans. With 23 556 plans available on our site alone, you, the consumer have a great array of choices to suit your needs and ideas. In keeping with the philosophy of the smaller home, small house plans abound. These plans are carefully drawn up considering the best possible stylistic, architectural and construction options available through the work of leaders in the industry. While searching through our small house plans you can rest assured you are looking through the best in what the housing design world has to offer. Efficiency is absolutely key. With the amount of knowledge and expertise that has been used in the development of house plans over the many years of their existence, these plans have grown steadily more refined. Redundancies have been cleared away. New techniques and technologies are considered. All in all, the value contained within the small house plans available rivals that of much more costly custom designs. When you are looking for the best possible smaller home for the best possible cost, small house plans are clearly worth your consideration. At Monster House Plans, we have a vast selection of small house plans for you to choose from. This entry was posted in Small House Plans on August 14, 2013 by HouseplanGuy.